Don't know about you all out there in KR land, but it's about time we got something new on the site, don't you agree? How about two new locations?! The Outskirts and KR's own Chinatown (better known as the Huna Orient District) are the new additions to the bustling island of Kapuhai Reef! In the Outskirts of KR, you'll find the busy, �Alepo�i Basin Harbor cargo port and finally, a way on and off of the island, Kapuhai Reef International Airport! 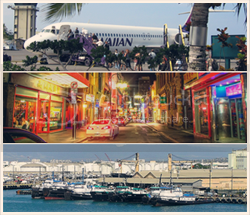 The Huna Orient District houses some new asian-inspired shopping locations and entertainment that you're sure to love!